Do you need a multipurpose cleaning cloth? TIDDOX's PREMIUM MICROFIBRE CLEANING CLOTHS are just the thing for your business. These non-abrasive towels are tough enough to be used with solvents, yet won’t scratch a toddler’s face. The microfiber makes this one of the best towels for industries in which you have to polish surfaces – whether those surfaces are windows, mirrors, lenses, stainless-steel counter tops, or floors. So often, the smaller cotton cloths we often use just don’t have the ability to absorb enough volume to clean up a mess. But our cleaning cloths measure 40cm X 40cm, and are just the right size to fit into your toolbox. If you are rushing around the daycare or garage and have a spill, just drop one of these towels on it. You can come back to it later, scoop it up, and drop it in the laundry. It’s that absorbent! It’s great in elder-care situations, because you can gently wipe off a person’s hands, but then use the same cloth with solvents to scrub a stubborn stain. 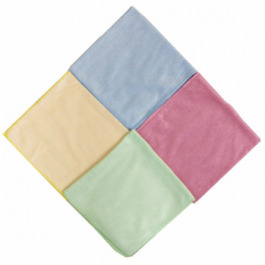 The premium microfiber cloths come in the four primary colors to make it easier to color code them. They are low-lint fabric, so they are perfect for shining glass or mirrors. These cleaning towels come in packs of 10 cloths, and you get 10 packs per carton. The medical profession has to deal with plenty of rampant fluids. Urine, blood, feces, vomit, and more often have to be scrubbed out of the ambulance floor or the emergency department counters. Even at the nurses’ station you’ll find TIDDOX's MEDICAL MICROFIBRE CLEANING CLOTHS kept handy for a quick run down the hall. They are colour coded for versatility. These soft, absorbent cloths are tough enough for the job, and they can be laundered and used over and over again. Car interiors and exteriors will shine after being buffed with one of these CAR CARE MICROFIBRE WIPES. They are absorbent and soft so that you can shine windows, mirrors, and chrome – or what passes for chrome these days. They don’t have any lint on them so you won’t have that mess to deal with. Buff out the new wax job or soak it in solvent to scrub off tar. These towels can do it all – and you can wash them and use them again! Our premium INDUSTRIAL MICROFIBRE WIPERS are perfect for your machinery. They are low-lint and soft for wiping down fine-tolerance tools. But, they are also tough enough for messy cleanups. An automotive garage is a great place for our AUTOMOTIVE MICROFIBRE TOWELS. They will soak up oil, grease, antifreeze, and even brake fluid. But, they are strong enough to be used to scrub up a mess. The hospitality industry needs HOSPITALITY MICROFIBRE CLOTHS that can be laundered and reused. Our colour-coded towels are just that – you can assign specific colours for each department, and have a cleaner facility! Great for use in restaurants, both front of house to clean tables and bar counters and back of house in kitchens. Hotels commercial cleaning staff also use the premium microfibre products becuase of their versititity in cleaning. Daycares and aged care facilities go through a lot of towels every day. These HEALTHCARE MICROFIBRE CLOTHS are perfect for people and objects. They are soft enough to be used on skin, and tough enough to scrub a table top.